Earlier this month, the state of Hawaii descended into a brief if existentially terrifying panic as its Emergency Management Agency dispatched a mass text message warning of an imminent “BALLISTIC MISSILE THREAT” after an employee pressed the wrong button. Many residents immediately scrambled for cover from what they believed was an inbound nuclear missile from North Korea. The state did not distinguish itself sending out corrections, either, taking the better part of an hour to send out another mass text confirming no such missile existed. Although senior state officials were immediately alerted of the mistake, it took 17 minutes for Gov. 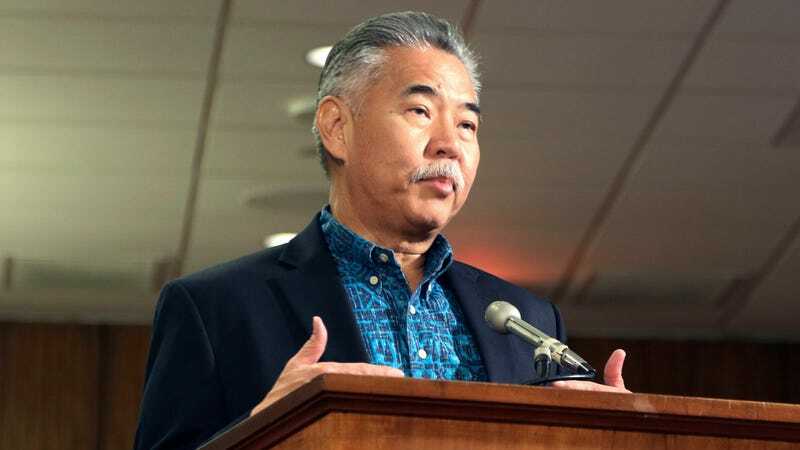 David Ige to send his own tweet telling people to calm down. According to the Honolulu Star Advertiser, that’s in part because he was coordinating with emergency officials and in part because he forgot his Twitter password. It’s good to know that we’re all really prepared for nuclear war. As noted in the New York Times, while officials are in universal agreement the false alert was unacceptable, they say changes are in the works to prevent any possible do-overs—which is good, because relying on Twitter to reassure the populace they’re not about to face Armageddon doesn’t seem to have gone particularly well.